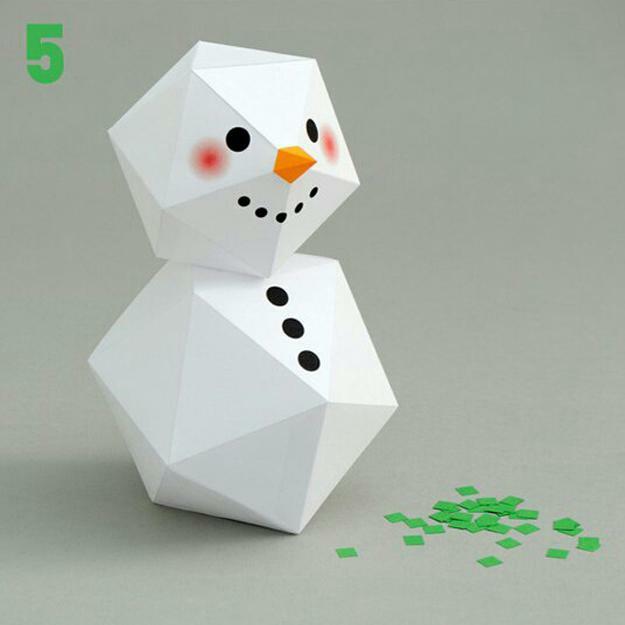 Geometric snowmen are fabulous craft ideas that use imagination to create unique handmade Christmas decorations. Creating paper crafts is fun and eco-friendly. Making snowmen is a soothing and relaxing activity, perfect for doing in groups and teaching kids the technique and Green decorating ideas. Christmas crafts are an ideal opportunity to recycle paper and spend time with a family and friends. It is a cheap way to make decorations for Green Christmas and all eco-friendly winter holidays. Snowmen are beautiful accents that enhance the spirit of the cold season and add festive characters to home decorating. Also, recycling paper and crafts turn clutter into unique gifts which are inexpensive but original and unique. Paper crafts are relaxing. 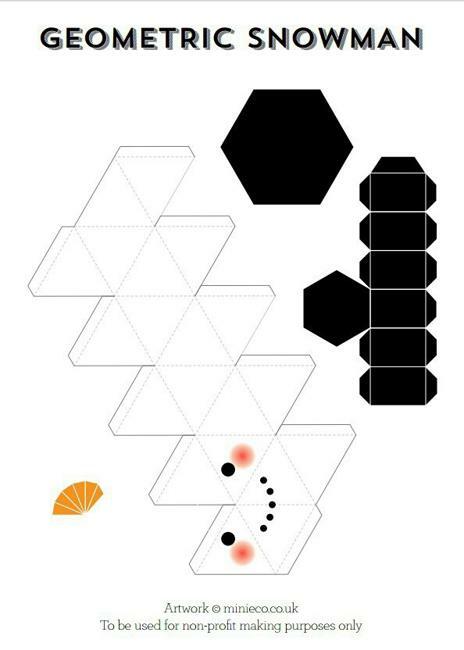 Concentrating on a simple geometry like folding paper and creating new shapes is meditative. It is an easy way to make decorations while releasing stress and recycling paper. Simple handmade holiday decorations and recycling paper crafts create beautiful ornaments and sculptures that yield a sense of satisfaction and pride. Folding black, white, and orange papers and making a snowman allow quickly to finish the project and feel a sense of accomplishment. Made of paper snowmen are an inexpensive way to create small work of art and enhance winter home decorating. Catching up with friends or spending quality time with kids while folding the paper and creating handmade Christmas decorations can be a delightful way to strengthen your relationships. Recycling paper helps create clutter-free living spaces at home. 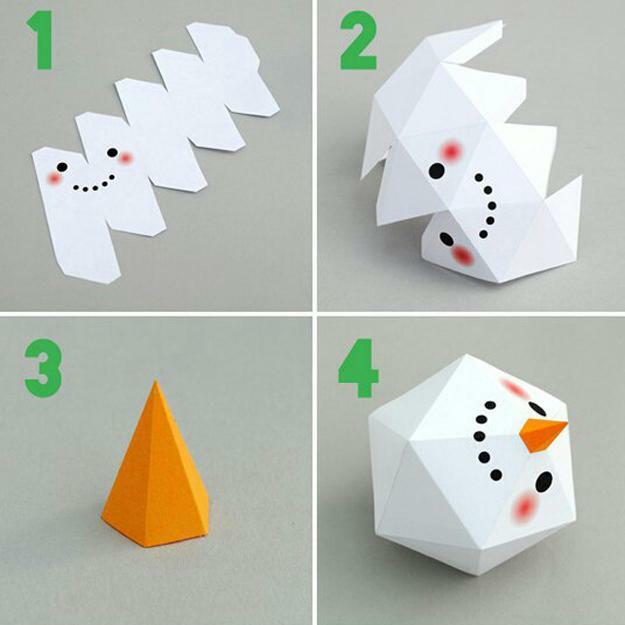 Snowmen are paper crafts that are not just attractive. The Green designs show your effort and appreciation of Green ideas. Kids enjoy making paper crafts and can compare their snowmen while helping each other work through the pattern. Geometric sculptures can be small or large. Snowman crafts can make fun decorations and turn into lovely gifts. Enclosing a snowman in a present or using snowmen as individual table centerpieces create delightful surprises that brighten up winter holidays. Snowmen are traditional winter decorations, working as Christmas ornaments and New Year Eve decor accents. Snowman crafts ideas are perfect for the winter season. The geometric designs are straightforward. They make cheap decorations offering a creative way to brighten winter days and enjoy Green ideas. Here is one of the ways to make decorations for Christmas, New Year Eve or any other winter occasions. 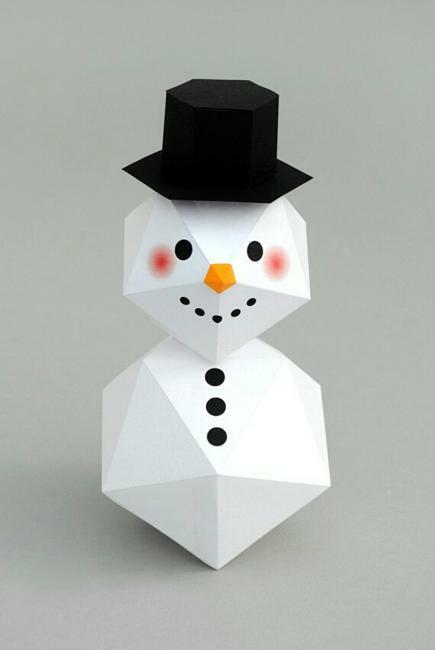 Geometric snowmen are fun holiday decorations that can stay on a table till spring. There are numerous ways to alternate the snowmen crafts, adding beautiful details and creating beautiful scenes that reflect the spirit of the winter holiday season.